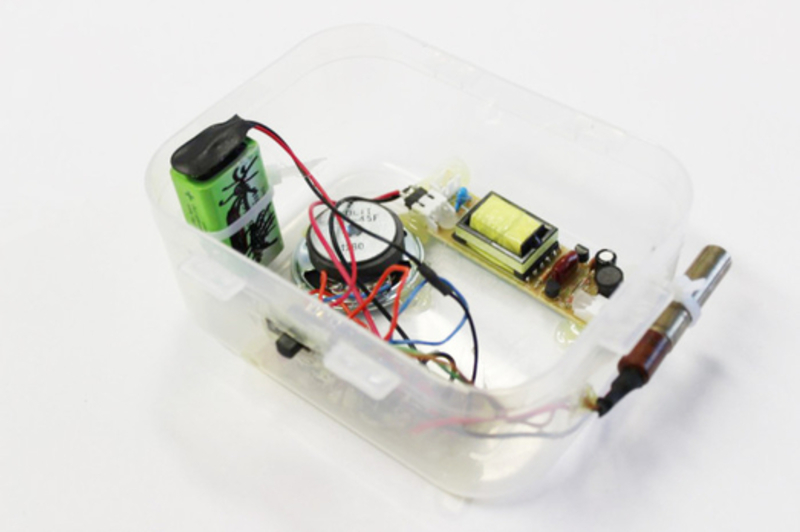 As part of the Case Pyhäjoki project in 2013, Erich Berger and Martin Howse designed a minimal, low budget geiger radiation detector which is fast and simple to build. The detector serves as an introduction for the workshop participants to start a relationship with the complex political, economic and artistic positions orbiting the phenomena of nuclear decay. During DYI Geiger Counter workshop participants are guided through their own construction of the radiation detector device. The geiger counter building manual presents the principles of how the counter works, lists all the parts needed for it and where to get them and then explains in close detail how to build a geiger counter. The geiger counter beeps and flashes a led-light when it detects radiation. The geiger counter building manual layout was designed by Daniela Palimariu and Finnish translation is by Maarit Laihonen. This design is published under the GNU General Public License. Erich Berger is an artist and cultural worker based in Finland & Denmark. His interests lie in information processes and feedback structures, which he investigates through installations, situations,performances and interfaces. His current explorations of deep time and hybrid ecology led him to work with radiogenic phenomena.